Two Jack Lake is close by Banff and a favored spot to enjoy. One of Banff's campsites are on its shores. The view down the valley of Mt. Rundle are so engaging and the lake becomes a great relflecting pool for this famous peak of the Rockies. The graceful mix of high mountain peaks and high alpine lakes are the fibre of the Canadian Rockies. 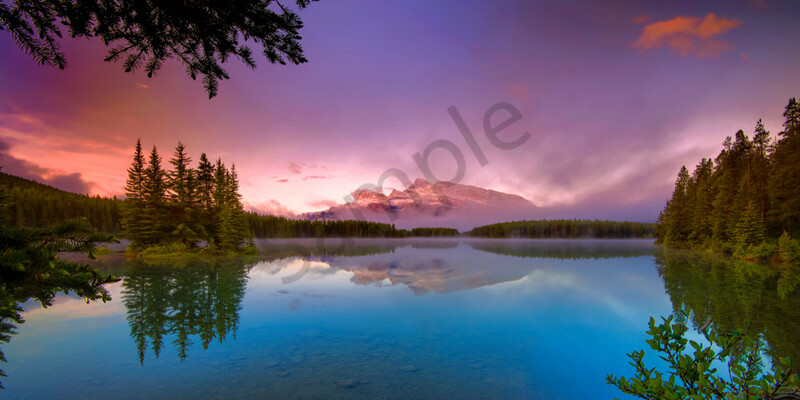 Two Jack Lake, close by Banff offers this now iconic view of Mt. Rundle , the overseer of the Banff and the Bow Valley. As I waited for sunrise and the light to paint over Rundle I was treated to the haunting call of Loons. The wonder of the Canadian Rockies all presented on this Spring Morning sunrise for your enjoyment.